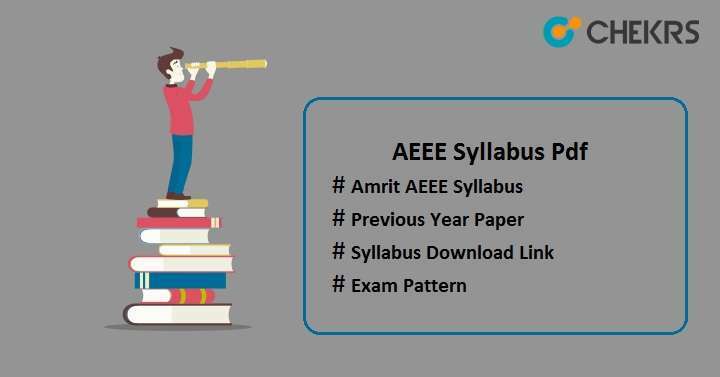 AEEE Syllabus 2019: Amrita Engineering Entrance Exam is an entrance exam conducted at national-level for admission in Amrita Vishwa Vidyapeetham in to B.Tech course. To crack the entrance exam, candidates should know the exam syllabus first then the exam pattern. The syllabus of AEEE 2019 will be comprise of topics from Physics, Mathematics and Chemistry of class 11th & 12th. All the questions in the examination will be prepared based on the syllabus prescribed by the university for the engineering entrance exam of Amrita University.In this article we are providing both syllabus and exam pattern to make things easy for you. Candidates must go through the complete Amrita AEEE Syllabus, The link is provided below. AEEE Subject-wise Syllabus is provided here, check it and start your preparation now accordingly. The Exam Authority will provide official syllabus on the Amrita University portal for the upcoming engineering entrance exam. But for the exam preparation, candidates can check the previous year syllabus, as syllabus is not changed according to the official information we have till now. The syllabus is still available on the official website. If there will be any changes, we will update you after getting official notifications. Candidates need to check the exam pattern of AEEE to qualify the entrance exam in a better way. The AEEE Exam Pattern will help to check out the type of questions, difficulty level of question paper, no of questions, marking scheme, mode of exam, time duration of exam, etc. AEEE exam is conducted through both online & offline on different dates. We hardly managed to collect some of the AEEE Previous Year Question Papers and Model Paper. All of them are listed below. We are still searching for papers and we will update the list whenever we will find them. For Better performance solve all these AEEE Model Papers / Previous Year Question Paper. We are trying to find More Papers then we will list them here.